How to claim benefit for multiple health insurance? Home » Health Insurance » How to claim benefit for multiple health insurance? Looking at the skyrocketing cost of medical treatment buying a health insurance policy is a sensible decision. It is generally observed nowadays that people buy multiple health insurance policies from different companies. It may be due to increase their sum assured, saving more tax under section 80D or to increase coverage of policy given by an employer. Whatever be the case but people generally get confused when it comes to claiming the benefit from multiple health insurance companies. Recently I have come across a case where policyholder was not aware that he can divide the claim but he cannot make a full claim for the same hospitalization to both the companies. However, in certain cases, it is allowed to claim benefits from multiple health insurance companies. So, in order to help you today, I will be sharing information about How to claim benefit from multiple health insurances? Suppose you have two health insurance policies with SA of Rs.3 Lac and SA of Rs.1 Lac. You end up in the situation where hospital bill is 3.5 Lac. Your both policy is supporting cashless facility but you have taken treatment in the hospital which is not covered under cashless network. Now as a hospital is not covered under cashless you need to compulsory settle the bill and apply for claim reimbursement. You got a single original bill from a hospital and bill value is 3.5 Lac. As bill amount is exceeding SA of single policy you have no choice but to claim benefit from both insurance policy. 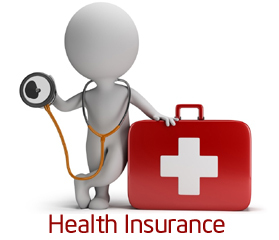 How to get claim reimbursement from two health insurance companies? Take Xerox copies of bills, reports and prescriptions, discharge form. Lodge a claim from any one insurance company stating amount of claim. Now submit all original bills, reports and medical prescriptions along with your claim to first insurance company. Suppose your claim with first insurance company is settled and company paid 3 Lac to you. Now it is time to lodge claim with second insurance company. Please get all Xerox copies of bills attested from hospital. Apply to second insurance company with attested bill copy and claim settlement summary. The second company will pay remaining amount to you. Suppose you have multiple health insurance policies and you have the option to use cashless facility also. In this case, you have two possible ways. Either to go for cashless claims in both policies or take the cashless claim from one policy and claim reimbursement from other policy. How to apply for cashless claims from multiple health insurance companies? In order to apply for cashless claim you need to submit pre authorization form to the insurer company. Fill up pre-authorization form of an insurance company and submit for the approval. Incase of multiple health insurances, you need to fill and submit multiple pre-authorization forms. Treatment can be started on approval of authorization form. You can also go for a cashless claim with one insurance company and claim reimbursement with a second insurance company. However, for claim reimbursement, you need to follow the traditional method of submitting a claim. Which Insurer to select while applying for claim? If you have two or more health insurance policies one common question will be which insurer I should select for a claim. Please refer to following pointers that will give you a correct direction. If you are insured under group health insurance by your employer, it is better to apply under that scheme. This will help you to increase no claim bonus in your individual health insurance plan. The next deciding factor will be terms and condition such as co-payment limit, pre medical hospitalization claim coverage etc. Hope now you are clear about claiming benefit from multiple health insurance companies. Have you ever came across a situation where you need to apply for a claim with multiple health insurance companies? Do share your experience in the comment section. One question – in the first option wherein you have cashless but treatment in a non network hospital. Usually one has to submit all original bills to the insurer within a specified period ( eg: one week after discharge), so it would not be possible to submit docs to one insurer and then wait till that claim gets settled, then submit to the next. You have very valid question.In this case you can submit claim along with xerox bill(certified) to second insurance company.You need to inform insurance company that first insurance claim is in progress and claim settlement summary will be submitted later. Sir this is a very nice and informative post. Claiming Multiple health insurance plans can get very tricky. Even the order of making the claim can affect the reimbursement amount.Co-payment and sublimits can create complications. I have captured a few examples in a post. Would love to have your inputs on the same. In my opinion, it is better to have one big plan rather than multiple plans with small coverage. Employer cover is a different issue altogether. What do you say?